First start with a jet engine. Then, perhaps add a second for auxiliary power. And, while your at it, throw in a rocket engine as well for some extra thrust. Add aluminum wheels with no tires. Hire a fighter pilot to “drive” it. Oh, and name it Bloodhound SSC (Supersonic Car). You’re on your way! Visit the official Bloodhound website here. Human beings achieved many ‘firsts’ in the 20th century. We climbed the planet’s highest mountains, dived its deepest undersea trench, flew over it faster than the speed of sound, and even escaped it altogether in order to visit the moon. Beyond visiting Mars, it may feel like there are no more milestones left to reach. Yet people are still trying to push the envelope, even if they have to travel a little farther to get there. Richard Noble is one such person. He’s spearheading a project called Bloodhound SSC that will visit uncharted territory on its way to a new land speed record on the far side of 1,000mph. The idea of a car capable of 1,000mph might sound ludicrous at first blush, but consider Noble’s credentials. The British businessman is responsible for previous land speed records in 1983 and 1997, the first of which came with him behind the wheel. Noble had been captivated by speed as a child after watching Cobb attempt to break a water speed record on Loch Ness in Scotland. Inspired by the achievements of fellow countrymen Campbell and Cobb, he wanted to reclaim the record for Britain. After building—and then crashing—one of the UK’s first jet-powered cars (Thrust 1), he acquired a surplus engine from English Electric Lightning. The Lightning was Britain’s late-1950s interceptor, designed to shoot down Soviet bombers over the North Sea. It was built around two powerful Rolls Royce Avon engines that gave it astonishing performance for the time. Just one of these engines was sufficient to convince John Ackroyd to accept Noble’s job offer as Thrust 2’s designer, and work began on the car in 1978, albeit in a shoestring fashion. Thrust 2, now with a more powerful variant of the Avon engine, went to Bonneville at the end of September 1981. Until now, Noble had only driven the car on runways in the UK, never faster than 260mph. For two weeks the team built up speed at Bonneville before the rain arrived, flooding the lake and ending any record attempts for the year. Thrust 2 had peaked at 500mph, but Gabelich’s record would stand for a while longer. Thrust 2 returned the following September to again find Bonneville’s flats under several inches of water. Once it was clear that Bonneville was no good for anything other than hovercraft, the search was on for a new location. Noble and Thrust 2 found themselves in the Black Rock desert in Nevada, now best known as the site of the Burning Man festival. Helpfully, the surface of the alkaline playa was much better suited to Thrust 2’s solid metal wheels. (At Bonneville these had cut ruts into the salt, requiring a new track for each run.) 1982 wasn’t to be Thrust 2’s year either, averaging 590mph and teaching Noble and his team a lot before the weather came and stopped things. Finally in 1983 everything went according to plan, and on October 4, Thrust 2 reached a peak speed of 650mph, setting a new world land speed record of 633.5mph. It’s easy to see how the mindset required to successfully break a land speed record wouldn’t be satisfied just doing it once; it seems everyone comes back for another bite at the cherry. Noble was no exception. He knew that Breedlove was planning on taking back the record and that the American had a pair of General Electric J-79 engines with which to do so. 700mph was the next headline speed, with the speed of sound not much further away. Eager not to lose the record, Noble planned to defend it with Thrust 2’s successor, Thrust SSC (the initials stand for SuperSonic Car). Thrust 2’s success came despite the lack of any significant aerodynamic design or refinement. Going supersonic meant that aerodynamics couldn’t be ignored any longer though. In 1992, Noble met the man who would design his new car, a retired aerodynamicist called Ron Ayers. 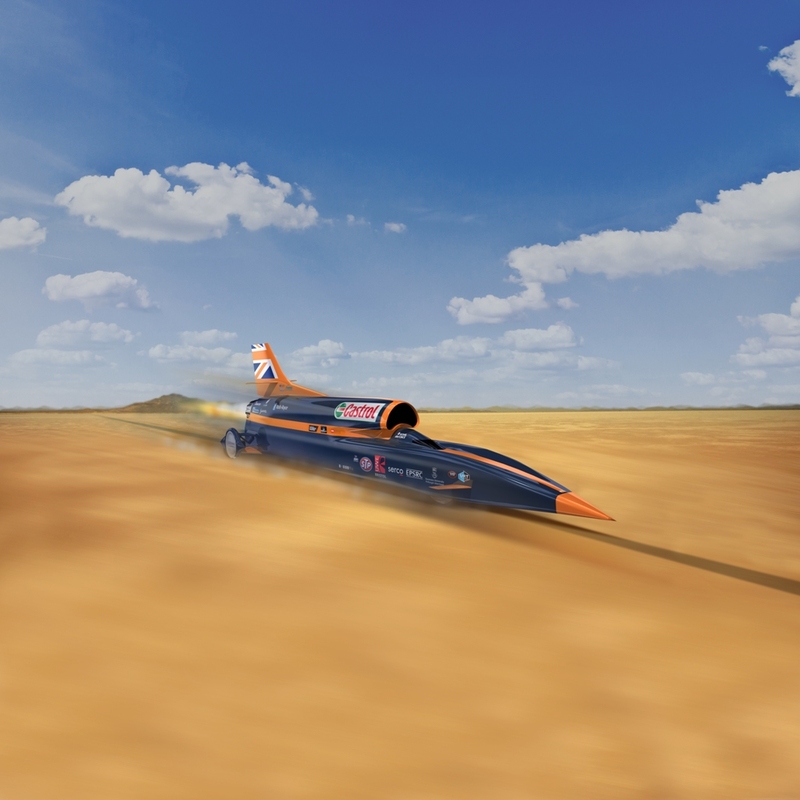 Ayers would learn much on Thrust SSC—and another land speed car, 2006’s diesel-powered JCB Dieselmax—that would inform his design for Bloodhound SSC. At first though, he was reluctant to get involved. “The first thing I told him was he’d kill himself,” Ayers told Ars. Yet curiosity got the better of Ayers, and he began to see solutions for the various problems that at first made this look like an impossible challenge. A second chance meeting between Noble and Ayers followed, and before long Ayers was Thrust SSC’s concept designer and aerodynamicist. Now, Ayers had the problem of working out what shape a supersonic car ought to take. That came from computational fluid dynamics (CFD). No one had attempted to use computer modeling to design a land speed record car until then, but even now no wind tunnels capable of supersonic speeds also feature a rolling road, necessary to accurately account for the effect of having wheels at those speeds. The University of Swansea in Wales created a CFD simulation of a supersonic vehicle, but “the problem was, at that time neither I nor anyone else trusted [CFD],” Ayers explained. His skepticism vanished following tests with scale models fired down a rocket sled track belonging to the UK Defense establishment (located at Pendine Sands, the site of many 1920s land speed records). The CFD data matched that from the rocket sled track to within a few percent, something that astonished both Ayers and the other aerodynamicists with whom he shared his findings. Thrust SSC would use a pair of Rolls Royce Spey engines, taken from a British F-4 Phantom, mounted quite far forward on either side of the car, with the driver’s cockpit in-between. Together with a long, pointed nose and a T-shaped tail fin and stabilizer, Thrust SSC looked much more like a jet fighter with no wings than a car. Fittingly, the car got a driver to suit its looks. Land speed records aren’t cheap, something Noble (and probably every other record chaser) knew from bitter experience. He managed to scrape together enough funding to make three record attempts with Thrust 2 even though his attention was split between fund-raising and learning how to operate and control the car. For the sequel he wisely decided to leave the driving to someone else, concentrating his efforts on leading the project and raising the money. Thirty people applied for the job, a mix of drag racers and fighter pilots. The successful candidate was one of the latter, RAF Wing Commander Andy Green. Green had plenty of supersonic experience in RAF Phantoms and tornadoes; he also had a daredevil streak, evident in his choice of hobbies. By 1997 the car was ready for Black Rock Desert. So, too, were Breedlove and his Spirit of America, setting the stage for a transatlantic, transonic shoot-out. Spirit of America narrowly escaped disaster the previous year, turning sharply right at ~675mph and rolling onto its side in the process. 1997 was to be no kinder to the Americans. On October 15, a sonic boom announced to the world that Green (backed by Noble) was now the fastest man on earth. Thrust SSC set a two-way average of 763mph, or Mach 1.015, exactly 50 years and a day after the first Mach 1 flight. Noble, Green, and Ayers set another land speed record in 2006, albeit with a much slower car. JCB Dieselmax set a new world record for a diesel-powered vehicle, reaching just over 350mph. Even though Bloodhound SSC will go much faster, Ayers told me they gathered a lot of useful knowledge then that is being applied to the current project. A number of factors appear to be necessary for a land speed record attempt: a car with a sufficiently powerful engine, a suitable location, and someone motivated enough to raise the money to make it happen. A little bit of competition helps with the last of these. Breedlove, Green, and Arfons spurred each other on in the 1960s, and it was the threat of Breedlove going supersonic that sparked Thrust SSC. As you might expect, competition was also the original impetus behind Bloodhound SSC. Noble learned that Steve Fossett was planning a land speed record attempt. The ballooning adventurer bought Spirit of America from Breedlove in 2006, and he set his sights on 800mph. Noble needed a new car that incorporated the lessons learned from Thrusts 2 and SSC. What makes the car go? The key to any land speed record car is its engine, and Bloodhound SSC is no exception. Rather than depend on decades-old surplus, Noble and Green approached the UK government to see if they could help. “We thought we’d earned the right to do this properly with the right technology,” Noble told the UK’s Director magazine. The Ministry of Defense agreed on the condition that Bloodhound SSC be exciting enough a project to rekindle the interest in science and technology that Apollo or Concorde created in the 1960s and 1970s. In return for inspiring a new generation of engineers, Bloodhound SSC could have an EJ200 jet engine, a type more often found in the Eurofighter Typhoon. Thrust SSC needed the combined thrust of two Spey jet engines to break the sound barrier. To go 30 percent faster, Bloodhound SSC will need more power than a single EJ200 can provide—at full reheat just over 20,000lbf (90 kN), roughly as much as one of the two engines on its predecessor (albeit at half the weight). The Bloodhound team decided upon rocket power for the remaining thrust. We asked Ayers why they opted for this approach, and he explained that it had several advantages over a pair of jets. For one thing, it needs only one air intake, meaning a lower drag design than Thrust SSC’s twin engines. To reach the kind of performance target Bloodhound SSC is aiming at with a pair of jets, it would require designing variable geometry air intakes. While this sort of engineering solution is used by fighter aircraft, it would add unnecessary cost, complexity, and weight to Bloodhound SSC. What’s more, a rocket can provide much more thrust for its size and weight than a jet. Finally, using rocket power means being able to accelerate much more rapidly, which should help limit the length of track needed. Image: Bloodhound SCC. Courtesy of Bloodhound.